A small but hearty and dedicated group of volunteers and Shirley Heinze staff began the process of reintroducing native plants to a barren, sandy dune ridge on the western edge of the Ambler Flatwoods. With the help of volunteers, Shirley Heinze Land Trust is planting 1600 plugs of herbaceous plants, representing 20 species. This effort is part of a long term strategy to conserve our Region's native habitats by improving biodiversity. Ambler Flatwoods, just 5 miles east of downtown Michigan City, evokes a landscape much farther away. It is a biome rare to Indiana, the boreal forest. And it is a corridor, like Northwest Indiana in general; a gateway between places, where mixing and mingling occurs: in this case between Earth's temperate zones and the tundra. At Ambler Flatwoods and the adjacent unprotected areas, plants common to Northwest Indiana's sandy oak savannas and moraine forests form a community with plants more likely found in the American Northwoods and the Eurasian taiga. The state of Indiana has recognized its significance, dedicating the property as a state nature preserve. 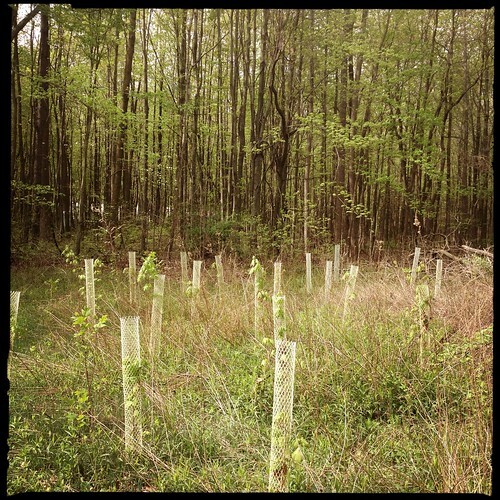 Shirley Heinze Land Trust has implemented the Boreal Flatwoods Conservation Project to educate local landowners and develop institutional partnerships to save and restore this complex and diverse community. Stewardship director Paul Quinlan offered some specifics about the restoration work occurring at this particular section of the site. "This dune ridge is a little different from the rest of the habitat found here, it had got really overgrown due to lack of fire over the years. I don't know if it was grazed but the understory was fairly poor and not very diverse. So we're planting at least 20 different species today to increase the biodiversity of it, which in turn will attract a great variety of insects and birds and animals." Stewardship assistant Danny Robertson explained the longer-term benefits of the day's work. "It's likely this soil was disturbed some time in the past so that means there's not much in the seed bank... it's just bare sand. So by introducing plants, they'll eventually go to seed and build up the seed bank." The many advocates of ecological biodiversity hope the term enters the popular lexicon, the way 'sustainability' has over the past few years. Shirley Heinze Land Trust offers a chance for a hands-on, on-site education on the concept, and the opportunity to put the practice into action. The next volunteer work day is 15 June at another LaPorte County site, Hillebrand Lake. Surrounded by private property, this kettle lake and morainal wetlands is generally inaccessible to the public. Those interested can RSVP at volunteer@heinzetrust.org or by calling 219-242-8558.